Keep unwanted food and other kitchen debris out of your pipes! This strainer is chrome plated plastic, not metal. 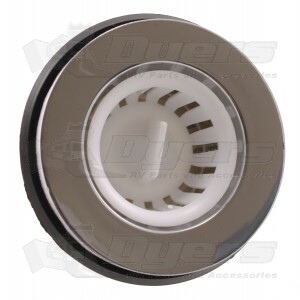 We needed a replacement kitchen sink strainer for our 2005 Allegro. This hard to find part was delivered quickly and works like the original. After 17 years the drain nut cracked in our kitchen sink. We live in a moderate climate, so it was just age that caused our leak. Had a little trouble searching out one on line, but we are very happy with this find. Not too happy with what one finds at the big box camper stores. Dyers did it for us. It's exactly the same one our RV manufacturer used on our 1997 motor home. Had purchased a used camper and found previous owner(s) had not properly winterized, and drain and sink were cracked. As all parts were glued together, had to replace sink, strainer and drain. All went well and back together now for years of use. Thanks for the quality product, good packing and fast delivery. Just the part I needed. Looked forever for part. Only place I found it. Made a happy camper. This is a low cost sink strainer assembly - which is what I was looking for. It worked well, but is made of plated plastic. In my application that does not matter, but make sure you are not expecitng a high-quality stainless part.